Nature—the sublime, the harsh, and the beautiful—offers something that the street or gated community or computer game cannot. Nature presents the young with something so much greater than they are; it offers an environment where they can easily contemplate infinity and eternity. We are extremely blessed to be located at a beautiful facility on thirteen pastoral and wooded acres abutting the Shenandoah National Park. Located just a few miles from town we enjoy both the convenience of closeness coupled with the expansive wildness of nature. The property is the perfect blend of a pastoral landscape with ample space for gardening and future livestock and a beautiful forest with mature trees, hiking trails and where wildlife abounds. A lovely creek runs through the middle and the children explore it all. 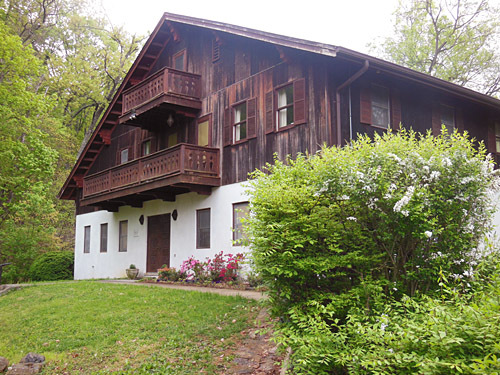 The building itself is designed in the traditional Bavarian style with touches of fine craftsmanship throughout. The interior environment has been carefully prepared to meet the physical, emotional and aesthetic needs of the youngest child, while many of the furnishings and materials have been hand-made by local craftsmen and the teachers themselves. Nature is imperfectly perfect, filled with loose parts and possibilities, with mud and dust, nettles and sky, transcendent hands-on moments and skinned knees.